Designation: Senior Consultant - Pain Physician | Intensivist | Phoenix Hospital, Allahabad. Dr. Rupam Kr. Sinha is a Senior Consultant who deals with all kinds of Chronic Pain, Neck Pain, Low Back Pain, Muscular Pain, all types of Neuralgias and Neuropathic Pain including that of due to Diabetes also. He has an expertise in preventing or Reducing the Feeling of Pain or Sensation during Surgery or other Painful Procedures. 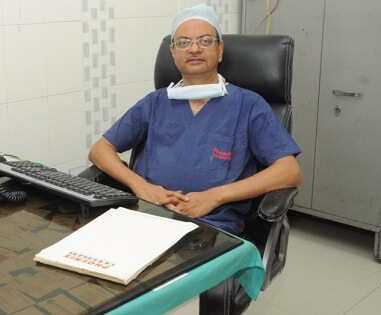 He has more than 20 years of experience in the field of Chronic Pain, Neck and Low Back Pain, Muscular Pain and he has a unique mix of experience of having worked in Academic Institutions and Corporate Hospitals in his field. He had worked as a Consultant with Ministry of Health - Saudi Arabia for 5 Years and with Bokaro General Hospital (A Unit of Steel Authority of India Ltd.) which is a 1000 Bedded Hospital in that area. Currently, he is working with Phoenix Hospital as a Promoter and Director.